As you may be aware, in addition to blogging hot takes about cars and giving you car buying advice, I run a consulting business where I actually help people buy cars. Sometimes, folks will come to me with a certain car in mind and I convince them to go in another direction. Here is this year’s list in helping folks make good automotive decisions. This list may actually surprise you. There are a lot of car enthusiast favorites here, including some staff favorites. But it’s not a list of bad cars—it’s a list of cars that came with bad deals, or had very obvious better deals elsewhere. You should keep them in mind when you’re car shopping too. It’s good to have a lot of choices and do your research, but also be open minded to something better out there too. When Porsche decided to ditch the lovely naturally aspirated six cylinder motor and replace it with a turbocharged-four in the new 718 Cayman/Boxster family, buyers got more power and more fuel efficiency for the about the same money. The new cars are quicker than the previous generation, but despite the improved spec sheets, a lot of people felt there was something missing. The new turbo engine in some ways just wasn’t the same as the old six. This year I had two customers leaning towards buying a brand new 718. The first was a software engineer who spec’d his car well into the $90,000 range. The other was a younger fellow also in the tech industry who wanted to treat himself to his first sports car and was aiming for a base model 718. The bigshot engineer ended up with a very nice CPO 2015 Carrera S and the younger guy saved some money by purchasing a used 981 Cayman with the naturally aspirated flat-six engine and all the goodness that comes with it. Remember, newer doesn’t always mean better. Despite all the hype and the fanfare, I didn’t get a ton of requests for the new Alfa Romeo Giulia. This is likely due to the fact that the vast majority of car buyers are barely aware that Alfa is back to selling cars in the American market, if that means anything to them at all. On the handful of requests that I did get, I tried to make the case that even though a new Alfa will be under the factory warranty, given the numerous reported reliability problems from multiple outlets it’s no fun having a car in the shop more than it’s on the road—even if you aren’t on the hook for repairs. The other problem with the Alfa is the dealership network. While my sample size is admittedly small, I found that some of the dealerships weren’t the most cooperative in terms of sending competitive quotes without any games. Needless to say, all of my clients who had the Alfa on their shopping list ended up with other luxury cars that offered more competitive lease deals with fewer hassles. 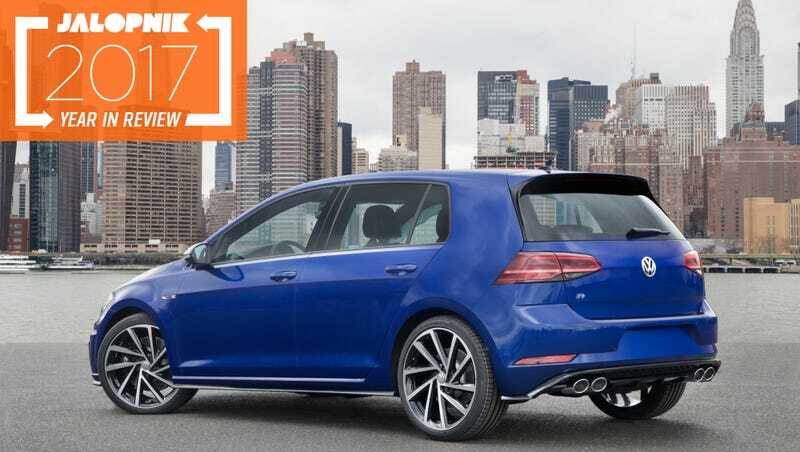 Let me start this by saying that the Volkswagen Golf R is an excellent car, and a perennial Jalopnik staff favorite. It does everything well and is a ton of fun to drive, and of the $40,000-ish hot hatches, it’s the best choice for someone who wants to go fast and look like an actual adult. But unlike the Alfa, the issue is not the product itself, but with greedy dealers who would rather sit on their inventory than make a sale. When the R first launched I had a lot of requests with the simple caveat that none of these buyers wanted to pay full sticker price for a $40,000 VW hatchback. They weren’t expecting miracles, but a few grand off the top would have made them happy. Yet almost every dealer that I spoke with when the R first came out wanted full price or more, which I could understand if the market supported it. But then I would notice the same Golf Rs sitting on those dealer lots for months. I would go back and say, “Hey, I still have a buyer if you give me close to invoice.” No dice; the cars continued to sit. All this Golf R inventory got built up and for a brief moment, you could score a deal on VW’s uber-hatch, and then the deals were gone. Instead I helped a ton of people get into new GTIs this year, and while I may have a personal bias for VW’s iconic hot hatchback, many of these customers saw the value in the GTI instead of the overpriced R.
Oh, I can hear the riots in the comments now about how a Jalopnik writer actively convinced people to not buy the Chevrolet SS. It’s almost sacrilegious, imploring people not to get one of the last V8-powered, manual gearbox rear-wheel drive sedans we have left. But you need to understand the context. When I was getting requests for the SS it was early in the model year and discounts were incredibly hard to find. While the SS may be objectively one of the best enthusiast cars GM made, the almost $50,000 price tag and looks that could be easily mistaken for a Malibu rental car didn’t help the cause. Even though there were no direct competitors in the new car realm (besides maybe the Dodge Charger), the two customers that requested an SS found themselves behind the wheel of a CPO Cadillac ATS-V and a lightly used E90 M3 instead. Granted, the value proposition of the SS was very different at the end of the model year when Chevy offered 20 percent off any remaining inventory. So if you scored one of the last manual SS sedans ever to be made and walked away with some cash in your pocket, well played. But deals were hard to come by for this thing, and for most buyers, the same performance could be had elsewhere for a lot less. Okay, so the Tesla Model 3 may not technically count since it’s not exactly for sale on a large scale. However, I had a few people come to me asking if they should retain their reservation spot for the Model 3 and wait it out or give up their slot and get something else. While I give Elon Musk a lot of respect for taking the successful Model S and scaling it down to a more affordable price point, I cited Tesla’s spotty track record for quality control and the Model 3’s current “production hell” as a reason to maybe wait until the bugs are worked out of the Model 3 before jumping on the bandwagon. Even though these clients won’t be early adopters of Tesla’s “game changer” they did ended up scoring some nice deals on lightly used EVs such as the BMW i3 and Chevy Volt. There’s a good chance the Model 3 may be great someday. But that day is not today. Not yet. So which cars did I recommend the most? That’s a tough question to answer because my recommendations are so often based on the individual client’s needs and budget, but there were a few cars that would rise to the top over and over again. The Mazda CX-5, Subaru Outback, and Audi A4 found a lot of customers this year. I was also very fortunate this year to find not one, but two Mercedes-AMG E63 wagons for clients with excellent tastes. Remember, there are a lot of great cars you can buy right now, but it takes being smart and doing the right legwork to secure a great deal as well.